Lucian Favre is having a great time at Dortmund. He has returned to German football, reuniting with Marco Reus and managing an extremely young and extremely talented team. Jadon Sancho has been in insane form, Marco Reus is playing regularly while Paco Alcacer has been banging in the goals. The midfield duo of Axel Witsel and Julian Weigl provides muscles and flair in equal dose. The biggest surprise so far? Dortmund are 3 points clear at the top of the table, with RB Leipzig at second and Bayern Munich not even in the top 4. While they have not been defensively solid, with two young centre-backs holding the fort, but with the firepower they have at the other end, they will always back themselves to out-score them. Atletico Madrid cannot believe their luck. They won just one of their first four games. They have just 15 points from the first 8 games. Yet, they sit just one point shy of the top. After a horrific start, Atletico have steadied the ship. A well earned draw against Real Madrid and routine wins has reinvigorated their title challenge and made the Atleti faithfuls dream again. Griezmann is firing on all cylinders, while Jose Gimenez and Lucas Hernandez look like the next solid defensive pairing for Atletico. Jan Oblak has been imperious while Koke and Saul have quietly gone about doing their job in the midfield. But the biggest positive would be the form of Thomas Lemar. The former Monaco winger has come good for Simeone and has resulted in Angel Correa upping his game as well, making for two inform wingers/wide midfielders, a rarity at Atleti. Inter Milan had a dream summer transfer window. They signed one of the best defenders in Serie A in Stefan de Vrij, got a solid full back in Kwadwo Asamoah from title rivals, signed the best box to box midfielder of the league in Radja Nainggolan and also signed the young and exciting Lautaro Martinez. But like every story, theirs also had a big anti-climax. They started off so poorly, that Luciano Spalletti’s job was in danger. But like another team in our power rankings, they turned in around in the premier European competition in Champions League. 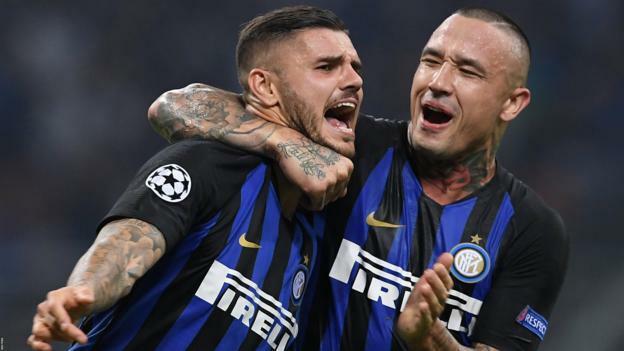 Coming back into it after 7 years, Inter Milan came from behind to defeat both Tottenham Hotspurs and PSV to sit on top of their group. Since Inter have turned their form around, the fans in San Siro have shown their support and backed their team in great voices in great numbers, thus making them a deserved 8th in the Power rankings. Napoli have had a roller coaster two months so far. A slow start made their faithfuls doubt the appointment of Carlo Ancelotti and miss Maurizio Sarri. But then Lorenzo Insigne rose like the knight in shining armour, banging in goals in game after game, recording his greatest start of a club season. Kalidou Koulibaly has cemented his position as one of the top 3 defender in Serie A. Arka Milik is back in form, Napoli are finally rotating players and everyone is happy. To cap it all off, Mr. Insigne scored a 90th minute winner to see of Liverpool at the San Paolo at top their Champions League group consisting of PSG and Liverpool. After an indifferent start, they are motoring along quite well and will be hoping to get out of their group at the expense of a big heavyweight. The odds of that are looking increasingly impressive right now. It is so tough to explain La Liga this season. Real Madrid have been using the excuse of Cristiano Ronaldo leaving week after week as they lose game after game. But what can FC Barcelona say? They have had a terrible start to the La Liga season, bagging just 15 points in their first 8 games, and are ahead of Atletico only on goal difference. Messi has been on fire, scoring goals and hitting the goalposts for fun. But Suarez’s goals have dried up. After a few promising games, Ousmane Dembele has also stopped scoring. Then why are they in the Top 10 you ask? It is because of their impressive start to the Champions League. They thrashed Spurs at Wembley, sitting pretty at the top of their group with 6 points alongside Inter Milan. Valverde clearly hasn’t got the hang of rotation, but he needs to improve quickly if Barcelona are to mount a serious title challenge in the La Liga. The top 5 teams are out now. You can read them here. Be sure to download the indifoot app to get to know the top 5 teams in Europe right now.